How will the exchange rate between South African currency and the US$ affect GS Custom Bullet prices? GS Custom now manufacture bullets in the USA . The exchange rate will therefore be of concern to other regions, until we start manufacturing there. Since our previous graph of the US$:SA Rand exchange rate on the 12th of July 2006 when the rand was trading against the US$ in a range of 1$:R 6.50 to 7.50 up to the 31st of January 2008, very little price fluctuation due to exchange rate occurred over this lengthy period. During the period 1 February 2008 to 22 September 2008 the exchange rate between the rand and the US dollar stepped up and fluctuated between 1$:R 7.50 to 8.00. 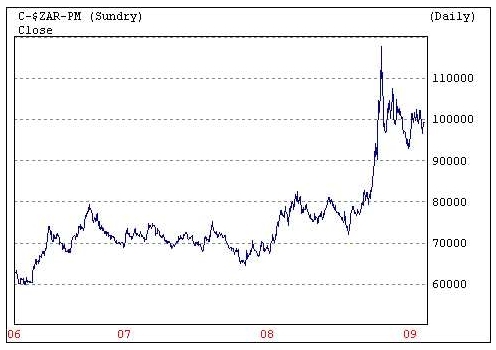 Thereafter the rand weakened sharply to reach 1$:R11.15 on 27 October 2008 and then gained strength again up to the current level on 13 February 2009 of 1$:R 9.95 as shown on the graph below. The SA Rand has steadily followed a weakening trend against major currencies, making our bullets more and more price competitive. One of our leading economists said: "Trying to project the exact path of the Rand in coming years is clearly not simple. Many forces will have a say, much of it currently still uncertain."